Bring your seedlings indoors for the winter, or keep your houseplants happy with more light! This Premium Light Stand offers plenty of room to start seedlings, and the adjustable shelves and light fixtures allow a variety of houseplants to get the light they need, too. The frame is lightweight yet sturdy, constructed of 1.25" aluminum tubing with heavy-duty 3" caster wheels for easy moving. 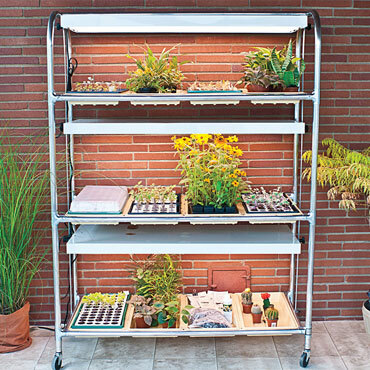 With three shelves and three fixtures with four lamps, this stand easily provides your plants with light. The set also includes 12 individual 22" x 11" trays, which can accommodate standard nursery flats but are well-suited to individual grow pots. The stand is 74" high, 53" wide, and 23" deep. Its 100 lbs of shipping weight is subject to overweight fees.